There are weddings, and then there are weddings. After seeing this couple’s wedding, you might never think about flowers the same way again. Folarin Alakija, entrepreneur and son of a Nigerian family that owns an oil company, married model Nazanin Jafarian Ghaissarifar, and their special day was a sight to remember. Celebrity florist Jeff Leatham, who is the mastermind behind all the floral arrangements at the Four Seasons, was brought on board to turn the Blenheim Place (the residence of the Duke of Marlborough in Oxfordshire, England) into a white wonderland. Let’s just say he knew what he was doing. Nazanin got married in a strapless gown that was timeless and elegant. She had eight gorgeous bridesmaids, who wore elegant one-strap dresses. Of course, one dress isn’t enough for this billionaire couple and their $6.3 million wedding, so Nazanin switched into a sheer number for the party portion of the event. She looked stunning—and she sorta matched the flower arrangements. The dance floor was elegantly decorated with the happy couple’s initials in gold. If this wasn’t a fairy tale wedding, we don’t know what is. And what good would an over-the-top wedding be without a surprise serenade from Robin Thicke?! Now let’s get to the good stuff: The food. Here’s a picture of their decadent menu, which featured five courses including foie gras, crispy duck egg, and poached summer fruit pudding. We kind of want to know if those were edible flowers, regular flowers, or just decorative icing? Whatever it was, we’re sure that cake tasted damn good. 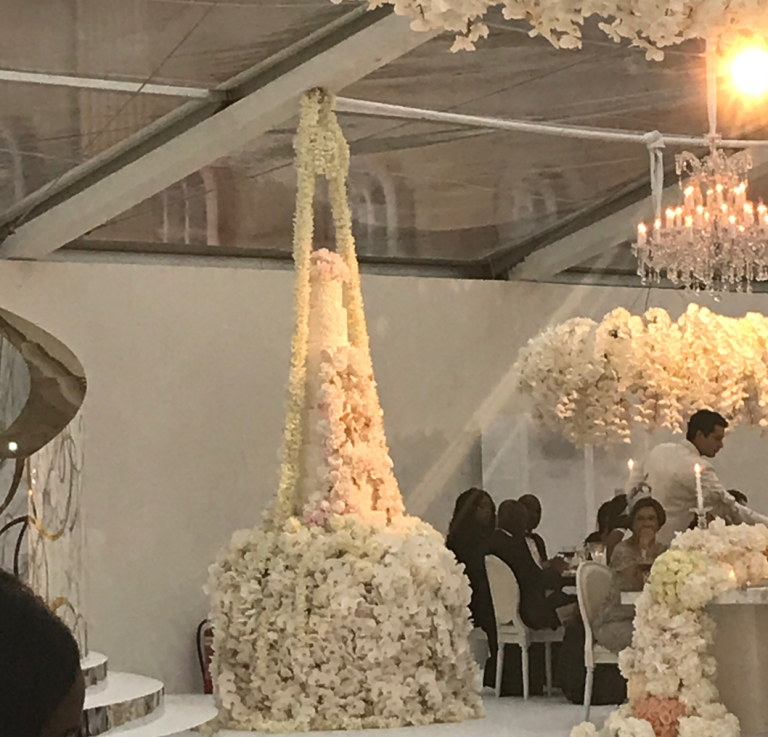 All in all, this lavish wedding cost $6.3 million dollars. We can’t say we’ll be expecting all that at our wedding, but it sure is nice to see what we’re up against. Congrats to the happy, gorgeous couple!